In the production of iron, iron ore, iron scrap, and fluxes (limestone and/or dolomite) are charged into a blast furnace along with coke for fuel. The coke is combusted to produce carbon monoxide, which reduces the iron ore to a molten iron product. This molten iron product can be cast into iron products, but is most often used as a feedstock for steel production. Blast furnace slag is a nonmetallic coproduct produced in the process. It consists primarily of silicates, aluminosilicates, and calcium-alumina-silicates. The molten slag, which absorbs much of the sulfur from the charge, comprises about 20 percent by mass of iron production. Figure 1 presents a general schematic, which depicts the blast furnace feedstocks and the production of blast furnace coproducts (iron and slag). Different forms of slag product are produced depending on the method used to cool the molten slag. These products include air-cooled blast furnace slag (ACBFS), expanded or foamed slag, pelletized slag, and granulated blast furnace slag. If the liquid slag is poured into beds and slowly cooled under ambient conditions, a crystalline structure is formed, and a hard, lump slag is produced, which can subsequently be crushed and screened. If the molten slag is cooled and solidified by adding controlled quantities of water, air, or steam, the process of cooling and solidification can be accelerated, increasing the cellular nature of the slag and producing a lightweight expanded or foamed product. Foamed slag is distinguishable from air-cooled blast furnace slag by its relatively high porosity and low bulk density. If the molten slag is cooled and solidified with water and air quenched in a spinning drum, pellets, rather than a solid mass, can be produced. By controlling the process, the pellets can be made more crystalline, which is beneficial for aggregate use, or more vitrified (glassy), which is more desirable in cementitious applications. More rapid quenching results in greater vitrification and less crystallization. If the molten slag is cooled and solidified by rapid water quenching to a glassy state, little or no crystallization occurs. This process results in the formation of sand size (or frit-like) fragments, usually with some friable clinkerlike material. The physical structure and gradation of granulated slag depend on the chemical composition of the slag, its temperature at the time of water quenching, and the method of production. When crushed or milled to very fine cement-sized particles, ground granulated blast furnace slag (GGBFS) has cementitious properties, which make a suitable partial replacement for or additive to Portland cement. Almost all of the blast furnace slag produced in the United States is reportedly utilized, and approximately 90 percent of this slag is ACBFS. The proportion of ACBFS currently being produced, however, is decreasing relative to granulated and pelletized blast furnace slag production. (2) The production of expanded blast furnace slag is no longer favored and is being replaced by the pelletizing procedure. ACBFS has been used as an aggregate in Portland cement concrete, asphalt concrete, concrete, asphalt and road bases. Pelletized blast furnace slag has been used as lightweight aggregate and for cement manufacture. Foamed slag has been used as a lightweight aggregate for Portland cement concrete. Granulated blast furnace slag has been used as a raw material for cement production and as an aggregate and insulating material. and granulated slag have also been used as sand blasting shot materials. Ground granulated blast furnace slag is used commercially as a supplementary cementitious material in Portland cement concrete (as a mineral admixture or component of blended cement). It is estimated that a relatively small percentage (less than 10 percent) of the blast furnace slag generated is disposed of in landfills. Blast furnace slag materials are generally available from slag processors located near iron production centers. Cements containing ground granulated blast furnace slag are available from many producers of Portland cement or directly from ground granulated blast furnace slag cement manufacturers. AASHTO M240 describes three types of blended cements containing slag. (3) They include Portland blast furnace slag cement (type IS), slag modified Portland cement (type I (SM)), and slag cement (type S). The primary distinction among the three types is the percentage of slag they contain. Slag cement may contain Portland cement or hydrated lime (or both) while the other two are blends of Portland cement and slag only. Many specifying agencies consider ACBFS to be a conventional aggregate. It is extensively used in granular base, hot mix asphalt, Portland cement concrete, and embankments or fill applications. The material can be crushed and screened to meet specified gradation requirements using conventional aggregate processing equipment. Special quality control procedures may be required to address the lack of consistency in some properties such as gradation, specific gravity, and absorption. GGBFS is used as a mineral admixture for Portland cement concrete. Granulated blast furnace slag and vitrified pelletized blast furnace slag are also used in the manufacture of blended hydraulic cements (AASHTO M240). (3) When used in blended cements, granulated blast furnace slag or vitrified pelletized slag are milled to a fine particle size in accordance with AASHTO M302 requirements. (4) The ground slag can be introduced and milled with the cement feedstock or blended separately after the cement is ground to its required fineness. Table 1 lists some typical physical properties of air-cooled, expanded, and pelletized blast furnace slags. Crushed ACBFS is angular, roughly cubical, and has textures ranging from rough, vesicular (porous) surfaces to glassy (smooth) surfaces with conchoidal fractures. There can, however, be considerable variability in the physical properties of blast furnace slag, depending on the iron production process. For example, some recently produced ACBFS was reported to have a compacted unit weight as high as 1940 kg/m3 (120 lb/ft3). (8) Higher unit weights that are reported are generally due to increased metals and iron content in the slag and tend to occur in slags that are generated from blast furnaces with higher scrap metal additions. The water absorption of ACBFS can be as high as 6 percent. Although ACBFS can exhibit these high absorption values, ACBFS can be readily dried since little water actually enters the pores of the slag and most is held in the shallow pits on the surface. Granulated blast furnace slag is a glassy granular material that varies, depending on the chemical composition and method of production, from a coarse, popcornlike friable structure greater than 4.75 mm (No. 4 sieve) in diameter to dense, sand-size grains passing a 4.75 mm (No. 4) sieve. Grinding reduces the particle size to cement fineness, allowing its use as a supplementary cementitious material in Portland cement concrete. Table 3-2 depicts the typical chemical composition of blast furnace slag. The chemical compositions shown are in general applicable to all types of slag. The data presented in Table 2 suggest that the chemical composition of blast furnace slags produced in North America has remained relatively consistent over the years. When ground to the proper fineness, the chemical composition and glassy (noncrystalline) nature of vitrified slags are such that when combined with water, these vitrified slags react to form cementitious hydration products. The magnitude of these cementitious reactions depends on the chemical composition, glass content, and fineness of the slag. The chemical reaction between GGBFS and water is slow, but it is greatly enhanced by the presence of calcium hydroxide, alkalies and gypsum (CaSO4). a. Data source is the National Slag Association data: 1949 (22 sources); 1957 (29 sources); 1968 (30 sources) and 1985 (18 sources). Of all the slag types generated, air-cooled blast furnace is the type that is most commonly used as an aggregate material. Processed ACBFS exhibits favorable mechanical properties for aggregate use including good abrasion resistance, good soundness characteristics, and high bearing strength. Table 3 provides a listing of typical mechanical properties of ACBFS aggregates. Because of their more porous structure, blast furnace slag aggregates have lower thermal conductivities than conventional aggregates. (21) Their insulating value is of particular advantage in applications such as frost tapers (transition treatments in pavement subgrades between frost susceptible and nonfrost susceptible soils) or pavement base courses over frost-susceptible soils. Mineral Commodity Summaries 1993. Bureau of Mines, U.S. Department of the Interior, Washington, DC, 1993. Collins, R.J. and S.K. Ciesielski. Recycling and Use of Waste Materials and By-Products in Highway Construction. National Cooperative Highway Research Program Synthesis of Highway Practice 199, Transportation Research Board, Washington, DC, 1994. American Association of State Highway and Transportation Officials. Standard Specification for Materials, "Blended Hydraulic Cements," AASHTO Designation: M240-85, Part I Specifications, 14th Edition, 1986. American Association of State Highway and Transportation Officials. Standard Specification for Materials, "Ground Iron Blast-Furnace Slag for Use in Concrete and Mortars," AASHTO Designation: M302-86, Part I Specification, 14th Edition, 1986. Recovered Materials Advisory Notice (RMAN). Environmental Protection Agency, Federal Register, May 1, 1995. NSA 188.1. Processed Blast Furnace Slag, The All Purpose Construction Aggregate, National Slag Association, Alexandria, Virginia. Emery, J.J. "Pelletized Lightweight Slag Aggregate," Proceedings of Concrete International 1980, Concrete Society, April, 1980. Fax memorandum, S. Szoke, Ontario Ministry of Transportation to D. Horvat, National Slag Limited, April 7, 1995. Mineral Aggregate Conservation Reuse and Recycling. Report prepared by John Emery Geotechnical Engineering Limited for Aggregate and Petroleum Resources Section, Ontario Ministry of Natural Resources. Ontario, 1992. NSA 166.2. "Blast Furnace Slag, Ideal Backfill Material for Steel Sheet Piling," National Slag Association, Alexandria, Virginia. Short, A. "The Use of Lightweight Concrete in Reinforced Concrete Construction," The Reinforced Concrete Review, British Reinforced Concrete Association, Vol.5, No.3, September 1959. National Slag Limited. Letter, April 4, 1995, D. Horvat, National Slag Limited to P. Verok, MTO Construction Office, with Attachment, Overview Report, Leachate Mechanism, Blast Furnace Slag Technical Committee, Hamilton, Ontario, March 17, 1995. BQSF. Report of the Visit of the Slag Study Group of the Japan Iron and Steel Federation of BQSF, British Quarrying and Slag Federation Limited, June 29, 1978. BSI. British Standard Specification for Air-Cooled Blastfurnace Slag Aggregate for Use in Construction, BS 1047: 1983, British Standards Institution, 1983. NSL. The Leaching of Sulphur from Blast Furnace Slag, National Slag Limited, November, 1985. Nordrhein-Westfalen. Requirements for the Use of Processed Recycled Construction Materials and Industrial By-Products for Excavation and Road Construction from the Standpoint of Water Management, (Dofasco translation), Ministerial Publication 45, State of Nordrhein-Westfalen, July 18, 1991. JIS. Iron and Steel Slag for Road Construction, JIS A 5015, Japanese Industrial Standards, 1992. ASA. Guide to the Use of Slag in Roads, Australian Slag Association, 1994. Ohio EPA. "Interim Policy: Use of Blast Furnace and Steel Slag," State of Ohio Environmental Protection Agency, June 6, 1994. Noureldin, A. S. and R. S. McDaniel. "Evaluation of Steel Slag Asphalt Surface Mixtures", Presented at the 69th Annual Meeting, Transportation Research Board, Washington, January, 1990. Smith, M. A., Resources Policy, Vol. 1, No. 3, pp. 154-170, 1975. Air-cooled blast furnace slag (ACBFS) is considered by many specifying agencies to be a conventional aggregate that can be used in granular base applications. The high stability of ACBFS aggregates can be especially useful in construction over soft ground. Its ability to "lock up" in granular base applications provides good load transfer when placed on weaker subgrade. The lower compacted unit weight of blast furnace slag aggregates relative to conventional aggregates results in a higher yield (greater volume for the same weight). Some of the more desirable features of ACBFS in granular base applications include its ability to stabilize wet, soft underlying soils at early construction stages, good durability, ability to be placed in almost any weather, extremely high stability, and almost complete absence of settlement after compaction. Additionally, the high insulating value of blast furnace slag granular bases can be used to minimize frost heaving. ACBFS is readily processed using conventional crushing and screening equipment. The highest stabilities are obtained using crushed material with the largest maximum size that can be handled without segregation (generally 19 mm (3/4 in) to 38 mm (1-1/2 in)). ACBFS aggregates should be stockpiled for at least 1 month prior to shipping to the project. ACBFS aggregates should only be used above grade as granular base in the pavement structure and must be adequately separated from water courses to prevent immersion, and should not be used in poorly drained areas or in contact with stagnant or slow moving water. Some of the engineering properties of ACBFS aggregates that are of particular interest when ACBFS is used in granular base applications include gradation, compacted density, friction angle, bearing capacity, freeze-thaw resistance, weathering, hardness and impact resistance, abrasion, and drainage characteristics. Gradation: Blast furnace slag should be crushed and screened to produce a material that satisfies the grading requirements of granular base and subbase specifications, such as AASHTO M147. Compacted Density: The compacted density varies with size and grading of the slag, method of measuring, and bulk specific gravity of the slag. The compacted density of ACBFS ranges from 1120 kg/m3 (70 lb/ft3) to 1940 kg/m3 (120 lb/ft), which is somewhat lower than that of conventional granular materials. Allowance for this differential should be considered during design and in specifications in order to ensure equal volume irrespective of the type of aggregate used. Stability: ACBFS angularity and high friction angle (40° to 45&#;176 ) contribute to high bearing capacity (California Bearing Ratio (CBR) greater than 100). Freeze-Thaw Resistance: ACBFS aggregates display good durability with resistance to freeze-thaw weathering and erosion. Abrasion: AASHTO M147(5) requirements for Los Angeles Abrasion loss for granular base aggregates are typically waived for ACBFS since no correlation between the Los Angeles Abrasion test loss for slag in laboratory tests and degradation in field applications has reportedly been observed. For this reason ASTM has deleted this test for slag in its specifications (e.g., ASTM D692, D1139), and major slag-using states, such as Michigan, Ohio and Indiana, do not use this test procedure with ACBFS. Drainage Characteristics. ACBFS granular base is free draining and is not frost susceptible. Structural design procedures for granular base containing blast furnace slag are the same as design procedures for conventional granular materials. The same equipment and procedures used for conventional aggregate may be used to stockpile and handle conventional aggregates as appropriate for ACBFS. However, greater care is required when handling and stockpiling blast furnace slag aggregates to avoid brittle fracture that can result in excessive fines generation. Procedures should be employed to ensure uniform gradation and layer thickness. Good uniformity is obtained by combining the coarse and fine aggregates with optimum water for compaction at the blending plant just prior to placing. The material should be graded and placed in a manner that allows free drainage and prevents ponding within or adjacent to the material. The same test procedures used for conventional aggregate are appropriate for ACBFS. Standard field and laboratory tests for compacted density and field measurement of compaction are given by AASHTO T191(9), T205(10), T238(11), and T239(12) test methods. There is a need to resolve the aesthetic and environmental concerns regarding the odor and discoloration of water due to ACBFS leachate by conducting research to determine the properties (e.g., pH, redox conditions, etc.) that result in the discoloration and odor encountered in the field. Collins, R. J. and S. K. Ciesielski. "Recycling and Use of Waste Materials and By-Products in Highway Construction," National Cooperative Highway Research Program, Synthesis of Highway Practice 199, Transportation Research Board, Washington, DC, 1994. MNR. Mineral Aggregate Conservation Reuse and Recycling, Ontario Ministry of Natural Resources, John Emery Geotechnical Engineering Limited, Queen's Printer for Ontario, 1992. NSL. Air Cooled Blast Furnace Slag, Letter, National Slag Limited to Ontario Ministry of Transportation, April 4, 1995. 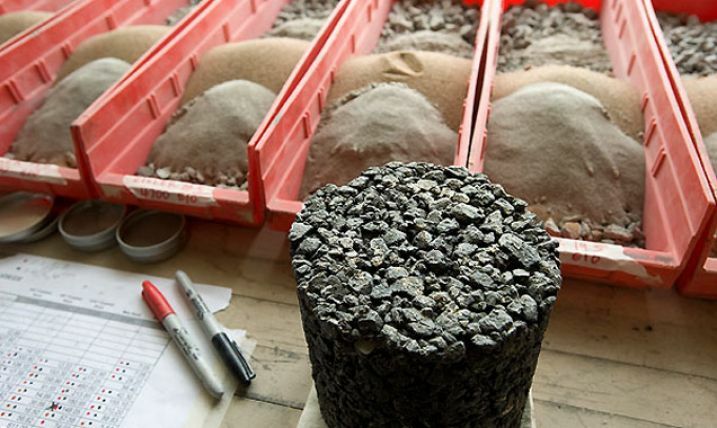 Testing and Acceptance Procedure of Crushed Slag Samples for Leachate Determination, State of Illinois Department of Transportation, Bureau of Materials and Physical Research. NSA 181-14. Processed Blast Furnace Slag, The All Purpose Construction Aggregate, National Slag Association, Alexandria, Virginia. ASA/RTA. A Guide to the Use of Slag in Roads, Australian Slag Association and Roads and Traffic Authority of NSW, New South Wales, Australia, 1993. Emery, J. J. "Slag Utilization in Pavement Construction," Extending Aggregate Resources," ASTM Special Technical Publication 774, American Society for Testing and Materials, 1982, pp. 95-118. Air-cooled blast furnace slag (ACBFS) is considered by many specifying agencies to be a conventional aggregate and can replace both coarse and fine aggregates in asphalt paving applications. ACBFS, however, is more absorptive than conventional aggregate and therefore has a higher asphalt cement demand. It also has a lower compacted unit weight than conventional mineral aggregates, which results in a higher asphalt pavement yield (greater volume for the same weight). At least 17 states have specifications covering the use of ACBFS as aggregate in surface course hot mix asphalt. They include Alabama, Colorado, Florida, Illinois, Indiana, Kentucky, Louisiana, Michigan, New York, Ohio, Pennsylvania, Tennessee, Texas, Utah, Virginia, West Virginia, and Wisconsin. (1) Hot mix asphalt containing properly selected and processed ACBFS aggregates demonstrates good frictional resistance in pavement surfaces, good stripping resistance, and high stability. The use of ACBFS aggregates in surface treatment applications has been accepted by many of the same jurisdictions that incorporate ACBFS aggregates in hot mix asphalt. Surface-treated pavements incorporating ACBFS aggregate demonstrate good friction resistance, good resistance to stripping, and fair wear resistance. However, the resistance of ACBFS to impact is not very high and the material can break down under heavy traffic conditions. Such aggregate is better suited to surface treatment applications on light traffic pavements. Hot mix asphalt and surface treatments require aggregates that exhibit consistent physical characteristics and quality. Special attention is required to address inconsistent physical properties of some ACBFS. More rigorous quality control is required in the selection and processing of ACBFS aggregates than conventional aggregates. Conventional aggregate crushing and screening operations are used to process ACBFS for use as an aggregate in asphalt concrete. Some of the engineering properties of ACBFS that are of particular interest when ACBFS is used as an aggregate in asphalt concrete include gradation, compacted density, absorption, abrasion, and freeze-thaw resistance. Gradation: Blast furnace slag should be crushed and screened to produce aggregate that satisfies the gradation requirements for hot mix asphalt as specified in ASTM D692(3) for coarse aggregate and AASHTO M29(4) for fine aggregate. For surface treatments, ACBFS aggregate should satisfy ASTM D1139(5) gradation specification requirements. Compacted Density: The compacted density of ACBFS ranges from 1120 kg/m3 (70 lb/ft3) to 1940 kg/m3 (120 lb/ft3), which is somewhat lower than that of conventional aggregates. Allowance for this differential should be considered during design and in specifications in order to ensure equal volume irrespective of the type of the aggregate used. Asphalt mixes incorporating blast furnace slag aggregates should be designed volumetrically. Absorption: The vesicular (porous) surface texture of ACBFS contributes to higher absorption than conventional aggregates. High absorption leads to an increased asphalt cement requirement (up to 3 percent more by weight of mix), resulting in an increase in the cost of the ACBFS paving mixes relative to conventional mixes. This is offset somewhat by the higher yield (volume per mass) of ACBFS paving mixtures because of the lower unit weight of the mix. Some of the properties of asphalt paving mixes that are of particular interest when ACBFS is incorporated into the mix include stability, frictional properties, resistance to rutting, and resistance to stripping. Stability: The angular shape and high friction angle (40° to 45° ) of crushed ACBFS contributes to good lateral stability when ACBFS is incorporated into paving mixes. This is particularly beneficial where hard braking and acceleration are considerations. Rutting Resistance: Asphalt concrete mixes containing ACBFS aggregates combine very high stabilities with good flow properties, resulting in a mix that resists rutting after cooling but is still compactable. Stripping Resistance: Due to its hydrophobic nature, ACBFS has a high affinity for asphalt cement (rather than water), resulting in excellent adhesive bond between ACBFS aggregate particles and asphalt cement and excellent resistance to stripping. Asphalt mixes containing blast furnace slag can be designed using standard laboratory procedures. Conventional AASHTO pavement structural design methods are appropriate for asphalt pavements containing ACBFS. The same methods and equipment used to store or stockpile conventional aggregates are applicable to ACBFS. Due to its brittle nature, some care must be taken in handling ACBFS, since excessive handling could result in particle breakdown. Since ACBFS is more porous than conventional aggregates, longer retention time for drying at the hot mix plant may be required. The same methods and equipment used for placing and compacting conventional pavements can be used for asphalt concrete containing ACBFS. There is a need to evaluate factors that contribute to the lack of consistency in the physical properties (gradation, specific gravity, absorption, and angularity) of ACBFS aggregates among individual slag producers and its effect on performance problems such as flushing and ravelling in hot mix asphalt. In addition, formal quality control procedures should be instituted to monitor the quality of specific ACBFS sources to assist in mitigating these problems. Collins, R. J. and S. K. Ciesielski. Recycling and Use of Waste Materials and By-Products in Highway Construction, National Cooperative Highway Research Program Synthesis of Highway Practice 199, Transportation Research Board, Washington, DC, 1994. MNR. Mineral Aggregate Conservation Reuse and Recycling. Report prepared by John Emery Geotechnical Engineering Limited for Aggregate and Petroleum Resources Section, Ontario Ministry of Natural Resources, Ontario, 1992. American Society for Testing and Materials. Standard Specification D692-94a, "Coarse Aggregate for Bituminous Paving Mixtures," Annual Book of ASTM Standards, Volume 04.03, ASTM, West Conshohocken, Pennsylvania, 1996. American Association of State Highway and Transportation Officials. Standard Specification for Materials, "Fine Aggregate for Bituminous Paving Mixtures," AASHTO Designation: M 29-83, Part I Specifications, 14th Edition, 1986. American Society for Testing and Materials. Standard Specification D1139-95, "Aggregate for Single or Multiple Bituminous Surface Treatments," Annual Book of ASTM Book of Standards, Volume 04.03, ASTM, West Conshohocken, Pennsylvania, 1996. American Association of State Highway and Transportation Officials. Standard Method of Test, "Resistance to Abrasion of Small Size Coarse Aggregate by Use of the Los Angeles Machine," AASHTO Designation: T96-83, Part II Tests, 14th Edition, 1986. Ryell, J., T. J. Corkill, and C. R. Musgrove, "Skid Resistance of Bituminous Pavement Test Sections: Toronto By Pass Project," Transportation Research Record No. 712, Transportation Research Board, Washington, DC. 1979. Heaton, B. S., N. Kamel, N., and J. J. Emery. "Asphalt Pavement Skid Resistance Predictive Models," Australian Road Research Board Proceedings, 1978. American Association of State Highway and Transportation Officials. Standard Method of Test, "Accelerated Polishing of Aggregates Using the British Wheel," AASHTO Designation: T279-83, Part II Tests, 14th Edition, 1986. Emery, J. J., "Slag Utilization in Pavement Construction," Extending Aggregate Resources. ASTM Special Technical Publication 774, American Society for Testing and Materials, 1982, pp. 95-118. Ground granulated blast furnace slag (GGBFS) has been used for many years as a supplementary cementitious material in Portland cement concrete, either as a mineral admixture or as a component of blended cement. The use of GGBFS in Portland cement is governed by AASHTO M302(1). Three types of ground granulated slag cements are typically manufactured. They include Portland cement as covered by AASHTO M85(2), Portland blast furnace slag cement (blended cement type IS), and slag cement (slag cement type S) as per AASHTO M240(3). The use of GGBFS as a partial Portland cement replacement takes advantage of the energy invested in the slag making process and its corresponding benefits with respect to the enhanced cementitious properties of the slag. Grinding slag for cement replacement requires only about 25 percent of the energy needed to manufacture Portland cement. Processing for use as a supplementary cementitious material requires grinding of the slag, typically using the same or similar plant and equipment as for Portland cement production. Some of the engineering properties of GGBFS that are of particular interest when blast furnace slag is used as a supplementary cementitious material in Portland cement concrete include the hydraulic reactivity of the slag and its fineness. Some of the properties of concrete mixes containing GGBFS that are of particular interest when it is used as partial cement replacement include strength development, workability, heat of hydration, resistance to alkali-aggregate reactivity, resistance to sulfate attack, and salt scaling. Strength Development: Concrete containing GGBFS develops strength at a somewhat slower rate than concrete containing only Portland cement, but ultimately can develop equivalent strength. This can be a concern where early strength development is important (staged construction where the first structure must develop strength before the second structure can be placed). Low temperatures (cold weather) generally have a more adverse impact on strength development with concrete containing GGBFS than concrete containing only Portland cement. Workability: Concrete containing GGBFS as a partial cement replacement has longer-lasting workability and low slump loss during hot weather construction. Heat of Hydration: Concrete containing GGBFS exhibits a lower heat of hydration than conventional Portland cement concrete. Conventional AASHTO pavement structural design methods are appropriate for concrete mixes containing GGBFS. GGBFS (or cement containing GGBFS) is handled and stored like conventional Portland cement. The same equipment and procedures used for conventional Portland cement concrete may be used to batch, mix, transport, place, and finish concrete containing GGBFS. The slower strength development of concrete containing GGBFS may require that the moisture be retained in the concrete for a longer period of time than what is normally required for conventional concrete. Scheduling of pavement construction should allow adequate time for the specified strength gain prior to the placement of traffic loads, the onset of freeze-thaw cycles, and the application of deicing salts. The same quality control procedures used for conventional Portland cement concrete can be used for concrete containing GGBFS. The primary issue associated with the use of slag cement is the reported loss of durability (salt scaling resistance) for exposed Portland cement concrete containing more than about 25 percent slag cement. It is unknown if any U.S. agencies are conducting specific research into this concern (some research has been reported in Canada). (5)During the mix design stage, a salt scaling resistance test (ASTM C672)(12) should be undertaken to assess the potential durability problems that may be encountered with the levels of GGBFS being used. Smith, M. A. Resources Policy, Vol.1, No.3, 1975. Afrani, I. and C. Rogers. "The Effects of Different Cementing Materials and Curing on Concrete Scaling," Cement Concrete and Aggregates, December, 1994. Recovered Materials Advisory Notice (RMAN). Environmental Protection Agency, Federal Register: May 1995. Emery, J. J. "Slag Utilization in Pavement Construction," Extending Aggregate Resources. ASTM Special Technical Publication 774, American Society of Testing and Materials, Philadelphia, 1982. Hogan, F. J. "The Effect of Blast Furnace Slag Cement on Alkali Aggregate Reactivity: A Literature Review," Cement Concrete and Aggregates, Vol. 7, No. 2, 1985. Hooton, R. D. and J. J. Emery "Sulfate Resistance of a Canadian Slag Cement," ACI Journal, Vol. 87, No. 6, American Concrete Institute, November-December, 1990. ACI. "Ground Granulated Blast-Furnace Slag as a Cementitious Constituent in Concrete," ACI Manual of Concrete Practice, 1990, Part 1, Materials and General Properties of Concrete, American Concrete Institute, ACI 226.1R, 1990. American Society for Testing and Materials. Standard Specification C672-92, "Scaling Resistance of Concrete Surfaces Exposed to Deicing Chemicals," Annual Book of ASTM Standards, Volume 04.02, 1993. Some positive features of ACBFS and expanded blast furnace slag include their low compacted density (which results in reduced dead weight load, reduced lateral pressures, and favorable transportation costs on a volumetric basis), high stability and friction angle, ability to stabilize wet, soft underlying soils at early construction stages, and the almost complete absence of settlement after compaction. Expanded blast furnace slag can also provide some structural strength because of its cementitious properties. Blast furnace slag requires minimal processing to satisfy the physical requirements for use in embankments. Primary crushing is generally adequate to satisfy gradation requirements. 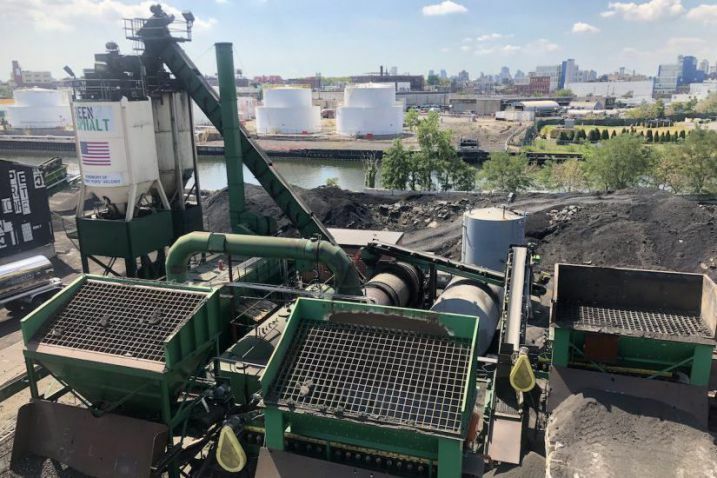 The aged ACBFS should pass the State of Illinois Testing and Acceptance Procedure of Crushed Slag Samples for Leachate Determination (Bucket Test)(13) prior to shipping to the project. Aged ACBFS aggregates should only be used above the water table, and should be adequately separated from water courses to prevent submersion in water, and should not be used in poorly drained areas or in contact with stagnant or slow moving water. A good groundwater drainage system is recommended when ACBFS aggregate is used to allow free drainage and to prevent ponding within or against the ACBFS. Some of the engineering properties of ACBFS that are of particular interest when ACBFS is used in embankment or fill applications include gradation, stability, compacted density, drainage characteristics, and corrosivity. Gradation: The gradation and physical requirements of AASHTO M145-82(14)are readily satisfied by ACBFS. Drainage Characteristics: ACBFS and expanded blast furnace slag are nonplastic and free draining and are not frost susceptible. Design procedures for embankments or fill containing blast furnace slag are the same as design procedures for embankments or fills using conventional materials. The same equipment and procedures used for handling and stockpiling conventional aggregates may be used to handle and stockpile ACBFS. ACBFS should be placed in a manner that allows free drainage and prevents ponding within or against the material. The same methods and equipment used to place and compact conventional aggregate can be used to place and compact blast furnace slag. The same test procedures used for conventional aggregate are appropriate for ACBFS. Standard field and laboratory tests for compacted density and field measurement of compaction are given by AASHTO T191,(20) T205,(21) T238,(22) and T239(23) test methods. There is a need to resolve the aesthetic environmental concerns regarding the odor and discoloration of water because of ACBFS leachate by conducting research to determine the properties (e.g., pH, redox conditions, etc.) that result in the odor and discoloration encountered in the field. Baumen, E.W. Blast Furnace Slag, Ideal Backfill Material for Steel Sheet Piling. National Slag Association, Alexandria, Virginia, 1966. Yu, T. R., and D. B. Counter. "Backfill Practice and Technology at Kidd Creek Mines," Rock Mechanics. CIM Bulletin, Volume 76, No. 856, August 1983. Sherwood, P.T. (Consultants). A Review of the Waste Materials and by-Product in Road Construction. Transport Research Laboratory, Department of Transportation, Contractor Report 358, Berkshire, 1994. American Association of State Highway and Transportation Officials. Use of Waste Materials in Highway Construction, Quality Construction Task Force, AASHTO Subcommittee on Construction, August, 1994. EPA. Hazardous Waste Listings: Fully Integrated Steel Mills. Final Report, Enviro Control Inc. for Environmental Protection Agency, May 1978. Emery, J. J. "Assessment of Ferrous Slags for Fill Applications." Reclamation of Contaminated Land Conference, Eastbourne, 1979. NSL. The Leaching of Sulphur from Blast Furnace Slag. National Slag Limited, November 1985. MOE. Leaching of Sulphur from Blast Furnace Slag - National Slag Limited Report, Letter, J.A. Pimenta, Laboratory Services Branch to City of Etobicoke Works Department, Ministry of the Environment, May 27, 1986. USCOE. Steel Mill Slag - Leachate Characteristics and Environmental Suitability for Use as a Streambank Protection Material, U.S. Army Engineering District, Pittsburgh, Corps of Engineers, March 1989. EPA. Environmental Protection Agency 40 CFR Parts 260, 261 and 262, Mining Waste Exclusion; Section 3010, (Bevel Amendment of RCRA), Final Rule, Federal Register, Vol. 55, No. 15, January 23, 1990. MNR. Mineral Aggregate Conservation Reuse and Recycling. Ontario Ministry of Natural Resources, John Emery Geotechnical Engineering Limited, Queen's Printer for Ontario, 1992. Testing and Acceptance Procedure of Crushed Slag Samples for Leachate Determination. Illinois Department of Transportation, Bureau of Materials and Physical Research. American Association of State Highway and Transportation Officials. Standard Method of Test, "The Classification of Soils and Soil-Aggregate Mixtures for Highway Construction Purposes," AASHTO Designation: M145-82, Part I Specifications, 14th Edition, 1986. Emery, J. J. "Slag Utilization in Pavement Construction," Extending Aggregate Resources. ASTM Special Technical Publication 774, American Society for Testing and Materials, 1982, pp. 95-118. NSA 188.1. Processed Blast Furnace Slag, The All Purpose Construction Aggregate. National Slag Association, Alexandria, Virginia. NSA 165-1. Slag Compares Favorably with Other Backfill Materials in 5-Years Underground Corrosion Study. National Slag Association, Alexandria, Virginia. Short, A. "The Use of Lightweight Concrete in Reinforced Concrete Construction," The Reinforced Concrete Review. British Reinforced Concrete Association, Vol. 5, No. 3, September 1959. American Association of State Highway and Transportation Officials. Standard Method of Test, "The Moisture-Density Relations of Soils Using a 5.5-lb [2.5 kg] Rammer and a 12-in. [305 mm] Drop," AASHTO Designation: T99-86, Part II Tests, 14th Edition, 1986.